The Balakot drama drowned discussion of an important event at the time — the US gave notice to withdraw zero-duty entry for Indian exports under its Generalized Scheme of Preferences (GSP). The US said Indian protectionism was unfairly hurting US exports. Lengthy bilateral negotiations failed to avert this setback, which will hit $5.7 billion of Indian exports covering 5,111 tariff lines. This sad outcome reflects faulty priorities and inflexibility in India’s economic diplomacy, with losses far exceeding gains. The commerce ministry tried to put a brave face on it by saying that US tariffs that will now be imposed are low, often below 4%, so the loss of preferences will amount to only $190 million. This grossly understates the problem. Many Indian labour-intensive exports are sold at very thin margins of 2% or less, so even small duties can render uncompetitive billions of dollars’ worth of Indian exports. Competitors like Bangladesh, Vietnam and Cambodia continue to get duty-free treatment from the US, and so will gain at India’s expense. History shows that no country has become a miracle economy — defined as achieving 7% GDP growth for over a decade — without buoyant exports. Domestic demand alone is not enough to create a miracle economy — the harnessing of global demand is vital. India enjoyed fastgrowing exports and fast-growing GDP from 2003 to 2014. After that exports fell and stagnated, and have finally recovered past the 2013-14 level only in 2018-19. Despite stagnant exports, India probably achieved 7% growth in the Modi years (the data is disputed). But such exceptional performance cannot last, and exports must be given top priority if India is to remain a miracle economy. This economic backdrop should have guided India’s economic diplomacy on GSP but did not. 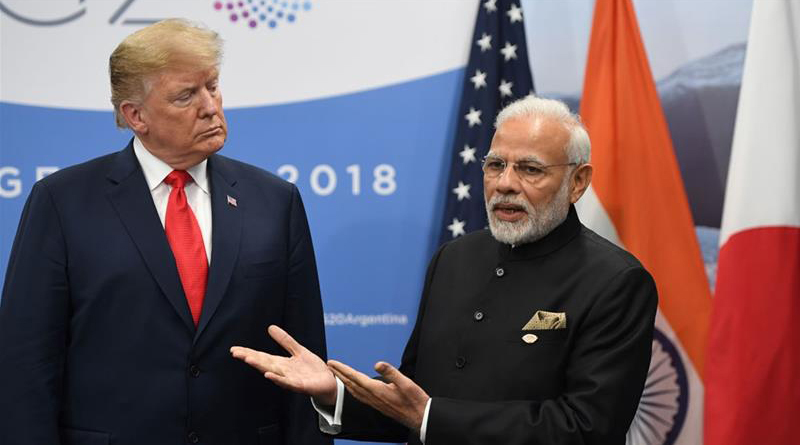 India remains instinctively protectionist despite declarations by Donald Trump that he will insist on much more reciprocity in trade. WTO rules provide ‘special and differential treatment’ for poor countries, as a form of aid. So, poor countries can erect some trade barriers even as developed ones lower theirs. This is most evident in the case of China. But India too is being asked to change. India now claims to be the third largest economy in the world, and a member of the G-20. Such a country needs to open up substantially, not demand concessions that looked reasonable when India was dirt poor. India is the largest user of anti-dumping suits in WTO to thwart imports. Under Modi, import duties have been raised on agricultural goods, textiles, electronic components, solar panels and “simple” manufactures like candles and clocks. The Modi government has also used price controls extensively in agriculture and medicines, affecting many foreign suppliers. Modi boasts of reducing medical and agricultural costs through price controls, but needs to realise that this opens India to retaliation. GSP withdrawal by the US illustrates this graphically. In bilateral GSP talks, US demands were modest. India had prohibited the import of dairy products from the US, saying this would hurt Hindu sentiment since many US farmers mixed animal parts in their cattle feed. This looked a protectionist ruse: no Hindu agitations have occurred on this count. India also imposed price controls on medical stents used for heart conditions, and on devices like knee implants. Good diplomacy would have found compromises to settle these complaints. India could have offered to allow the import of limited dairy products pending a scheme for certifying US cattle that were not fed animal parts. India could have lifted price control on high-end stents (the bio-absorbable and drug-eluting varieties) in which the US specialises, and which are used only by India’s rich, while continuing with price controls for lower-tech stents used by the masses. But the Modi government would not budge an inch. Nor did it budge on issues like India’s import duty on solar panels, which the US has now taken to the WTO for adjudication. Donald Trump complains repeatedly and bitterly about India’s high import duty on giant Harley-Davidson mobikes. Slashing this duty would be a very low-cost gesture to mollify the US: no Indian company makes these giant bikes, and demand is less than 100 bikes per year. Alas, Indian rigidity continued even when the US made it clear that the consequence could be a withdrawal of GSP. The rest is history.